Sweep Bends are one of Acu-Tech’s specialities! 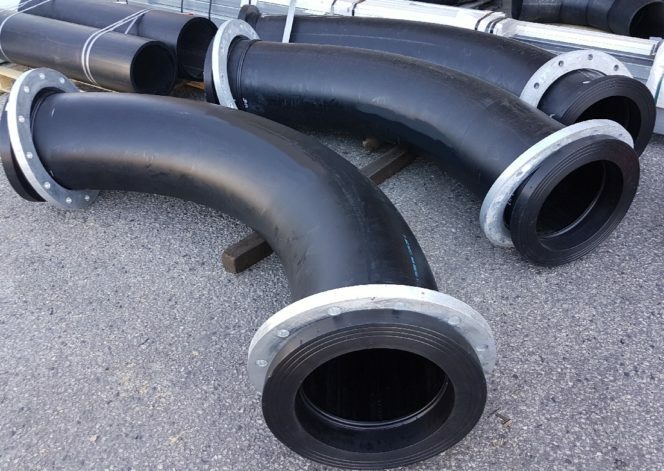 With a fully equipped plastic fabrication workshop and experienced and qualified operators, Acu-Tech Piping Systems fabricates PE Sweep Bends, spools and components from pipe and sheet to client specifications. 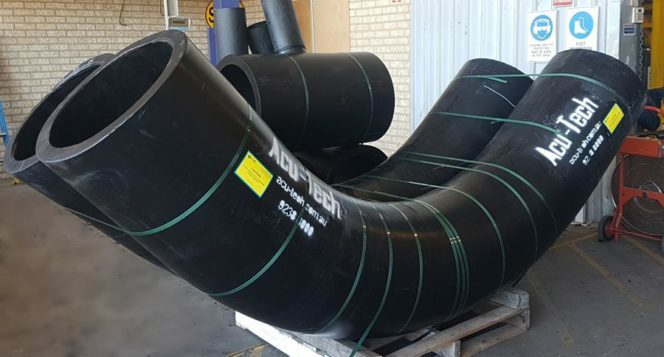 Acu-Tech’s Fabricated Poly Sweep Bends range in size from 30mm to 800mm, and can be manufactured from Acu-Black or Acu-Therm material, meaning a co-ex white pipeline can have a matching co-ex white bend! Sweep Bends can also be custom made in blueline stripe, or any other colour. 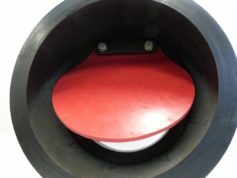 Acu-Tech stocks the standard sizes and angles of HDPE sweep bends, but can also manufacture custom sweep bends to suit your specification. 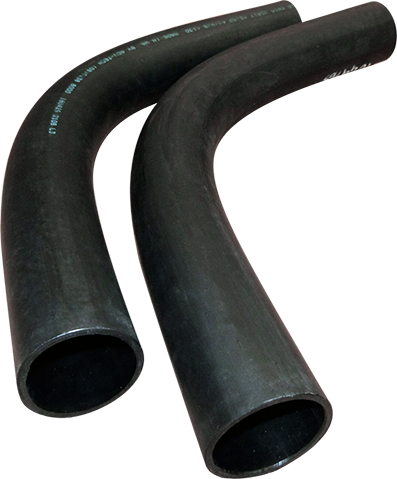 Seamless Long Radius HDPE Sweep Bends can be made with flanged ends, or with extra pipe length to allow space for electrofusion welding. 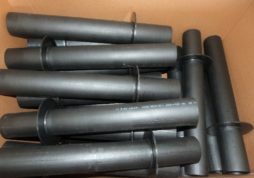 The method for fabricating PE Sweep Bends is mentioned in PIPA Document ‘PE Fabricated Fittings For Pressure Applications: De-rating Requirements’: Sweep bends are manufactured by heating a single section of pipe, ranging from SDR21 to SDR9, and then using a forming tool to reshape the heated area. 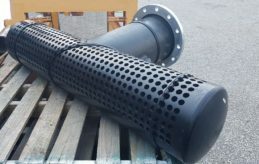 Typically the pipe segment to be shaped is immersed in a hot liquid bath or hot air oven and heated to make it pliable. It’s then removed from the heat source and reshaped in the forming tool. Care must be taken to hold the new shape without any induced stress until the part has sufficiently cooled. These manufacturing methods result in single piece bends at any angle up to 90°. 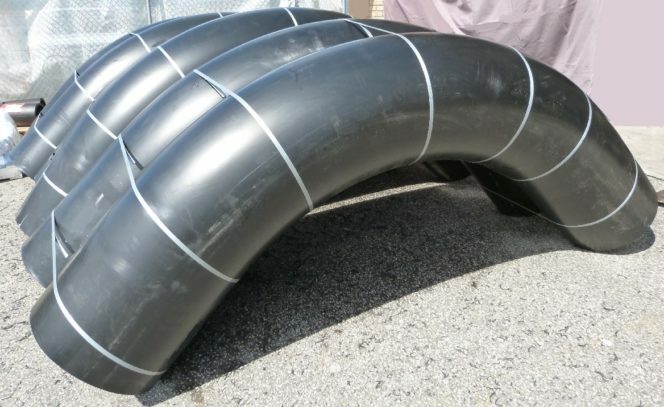 Sweep Bends are operated at the full pressure rating of the pipe without the need for de-rating, provided the minimum wall thickness of the fitting (taking into account wall thinning at the bend) complies with the requirements of AS/NZS 4130, for the rated nominal pressure of the pipeline. Our extensive fabrication capabilities includes sweep bends, junctions, concentric reducers, mitred tees, launders, manifolds, elbow pipe, true Y pieces, equal and reducing tees, and segmented bends ranging in size from 25mm – 800mm. For any other requirements and for fabricated items that are less common and not mentioned our catalogue, feel free to contact us and we will gladly assist.